Outside the context of a borrowed book, though, are these really so bad? I’m discomfited by the suggestion, for several reasons. The idea that Everything Must Be Pristine can be dangerous. For me, it plays into my largely unproductive perfectionist tendencies, and I become paralyzed by my fear of “messing things up” or “not doing it right” (the referent for “it” is All the Things). Accidents happen. People make mistakes. Deal with it, and move on. To forget my troubles, I’d escape into a good book, but even that, apparently, can be done “wrong.” Nooooo! Life is messy, literally and figuratively. Regarding the literal: A few years back, I bought a cozy pair of tan suede boots—super warm, super comfy, very cute. I will take the best care ever of these boots! I proclaimed to myself. And the universe chuckled. You know what we do in boots? We walk in them. And you know what sometimes happens when we walk? We get rained on and step into muddy puddles. And sometimes, when the universe really wants to teach us a lesson, we walk the length of the Stop and Shop parking lot before realizing the bottle of Fantastik we bought has leaked all over our new tan suede boots, and the boots we pledged to take such excellent care of are now drenched in electric blue liquid. Since when do wear and tear suggest an absence of love? This is something else I’m confused about: In stuffed animals, they are evidence of extreme love. But somehow, when it comes to books, a coffee stain, a greasy fingerprint, a torn cover, etc. have come to suggest the opposite of love. Yet for me, the aforementioned issues usually arise because I love a book so much that I can’t put it down. I’m reading it so hard that I refuse to set it aside while eating breakfast, drinking coffee, or walking up the stairs (that last one really isn’t recommended, though because it’s dangerous to your person. The book lovers’ list of “don’ts” suggests a book is a sacred object that must be protected from the ravages of time and human contact. But is anything outside of time on this planet, including the planet itself? I’d rather think of notes, tears, and stains as another kind of storytelling, which is the story of the reader, the book, and their relationship. What I mean by this is perhaps best exemplified in Geraldine Brooks’ People of the Book , a fictional account of the Sarajevo Haggadah, in which book conservator Hanna discovers within the pages of the book an insect’s wing, a white hair, and pages with saltwater and wine stains. These artifacts become a way to trace the story of the people who created, interacted with, loved, feared, and saved the book. Granted, your average paperback is nowhere near the hallowed work of art Brooks explores, but like everything else that passes through human hand (and heart), a book is inevitably marked by that touch. When I read a worn book, perhaps acquired at a library book sale, I can’t help but wonder about all the other readers who held it in their hands and what they thought about it. Like the experience of reading, it’s a reminder that we are not alone in our experiences. 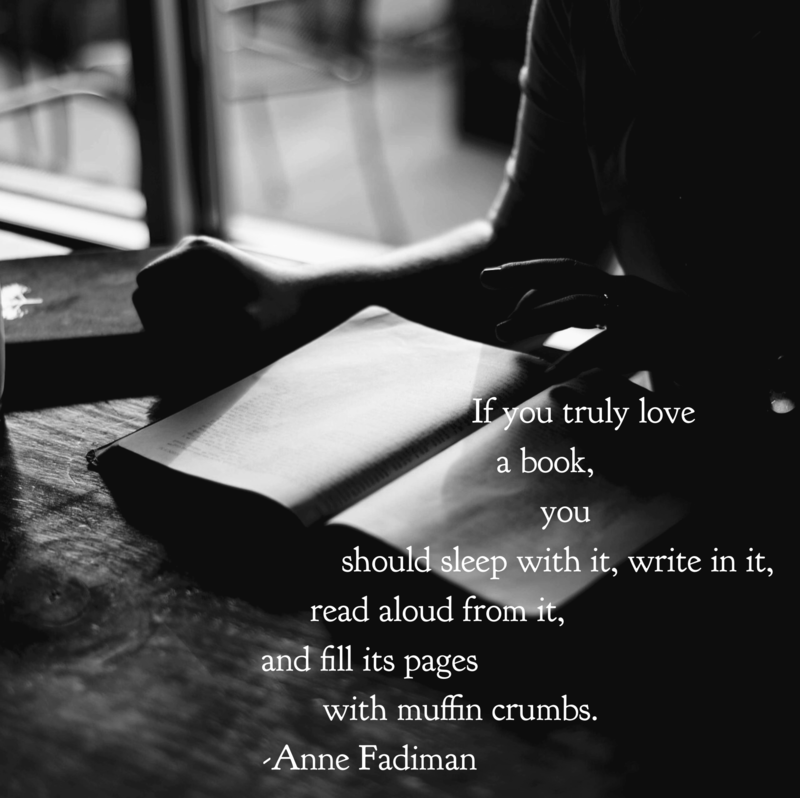 Anne Fadiman once said, “If you truly love a book, you should sleep with it, write in it, read aloud from it, and fill its pages with muffin crumbs.” Substitute “muffin crumbs” with “donut crumbs,” and we can be sure this has happened to a book of mine … though I don’t know if I’ll ever be comfortable writing in books. What do you think, book lovers? How do you feel about Fadiman’s directive? I’m of the “more ragged, more loved” camp. I am a huge fan of dog-earing, writing in books, and generally toting them everywhere. I tried being pristine for a while, but that’s just not my reading style. GREAT post! Thank you so much! This is awesome” “more ragged, more loved.” I feel like every piece of marginalia, dog ear, crease, and tear tells a little story about my relationship with a book. If it’s still pristine, it’s most likely a DNF. And what you wrote about “The People of the Book” and how you’re curious about who’s read a book before you makes me think of the poem “Marginalia” by Billy Collins. I feel like books are living, breathing things. I do agree about keeping borrowed books pristine, though….although I have to admit, I have a very bad habit of very slightly dog-earing pages of library books, if I’m using them for research and don’t have a bookmark or paper strips nearby. 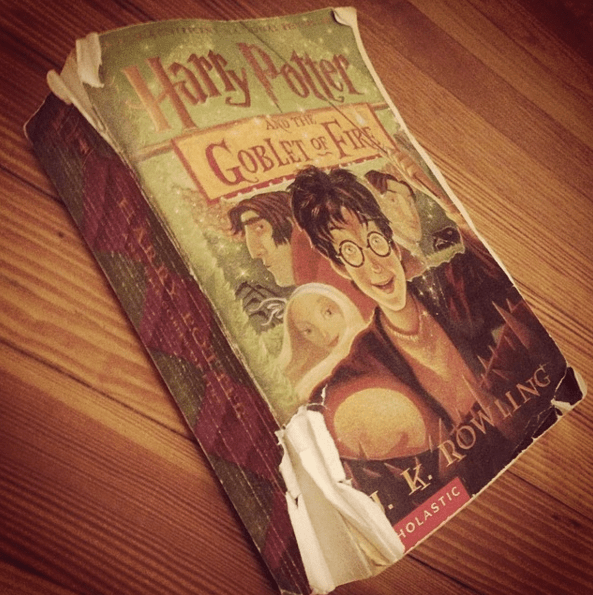 I always un-dog-ear the pages before I return the book, if that helps anything…. Now I feel a bit like a terrible person…. Oh, I love poetry. I discovered Billy Collins thanks to a friend. He was our US Poet Laureate and I understand why: His poems are easy to understand, yet still so eloquent and engaging – sometimes even funny. I hope you enjoy “Marginalia” – it’s one of my favorites by him.